Breast cancer is caused by repeated exposure of breast cells to circulating ovarian hormones. Clinical, animal and epidemiological studies have clearly demonstrated that breast cancer is a hormonally mediated disease and several factors that influence hormonal status or are markers of change in hormonal status have been shown to be associated with the risk of breast cancer. ,, A variety of constitutional risk factors have been reported, such as nulliparity, early onset of menarche, delayed first birth, late menopause, and decreased parity. These risk factors point toward endogenous estrogens as likely players in the initiation, progression, and promotion of breast cancer. , Nutrition, in its broadest sense, plays a role in breast cancer, identified through its relationship to known risk factors that probably act early in life. Though a large number of women are affected with breast cancer, very few studies have been undertaken in India on the association of reproductive factors with breast cancer. We conducted a hospital-based case-control study to identify the association of various reproductive factors with breast cancer. The present study was a hospital-based, matched, case-control study conducted in the tertiary care hospital in New Delhi. Three hundred and twenty newly diagnosed breast cancer cases (all consecutive cases) from the outpatient and hospital admissions of the Departments of Surgery/Surgical Oncology constituted the study population. The criteria for the selection of cases were as follows: (i) They should be proven cases of breast cancer by histopathology/cytopathology; (ii) they should have not undergone any treatment specific to breast cancer; (iii) they should not have suffered from any major chronic illness in the past, before the diagnosis of breast cancer so as to change their dietary pattern; (iv) they should not have taken long course of any vitamin or mineral supplements during the last 1 year; and (v) they should not be on corticosteroid therapy or suffering from hepatic disorders/severe malnutrition. Three hundred and twenty normal healthy individuals accompanying the cases in the Department of Gastroenterology, Medicine and Surgery at the hospital constituted the control group. The subjects in the control group were matched individually with the cases for their age ± 2 years and socioeconomic status. The criteria for the selection of controls were as follows: (i) The attendants of cases who did not suffer from any major illness in the past; (ii) they should not have taken long course of any vitamin or mineral supplements during the last 1 year; and (iii) they should not be on corticosteroid therapy or suffering from hepatic disorders or severe malnutrition. The study was ethically approved by the Ethics Committee of the institute. All the investigations to be performed were explained to the subjects, and those who consented for participation were included in the study, and informed consent was obtained. The patient and control groups were subjected to similar investigations. A pre-tested, semi-structured questionnaire was administered to each individual to collect information on identification data, socio-demographic profile and reproductive factors. The Chi-square test was used for categorical variables, and unpaired t-test was used for the continuous variables. The conditional Univariate logistic regression analysis (unadjusted odds ratio [OR] and confidence intervals) was used to calculate the significance level of each variable in the study. Multivariate forward stepwise logistic regression analysis taking inclusion and exclusion criteria of 0.05 and 0.21, respectively, was performed. A total of 320 breast cancer cases and an equal number of matched controls were included in the present study. The mean age of the cases was 45.5 years. It was found that 62.5% and 61.5% of the cases and controls were in the age-group of 30-50 years, respectively. Majority of the cases (61.9%) belonged to urban area of residence. All the cases were married, and about 95.9% of the cases and 95.6% of the controls were housewives. Nearly 37.2% and 35.9% of the cases and controls were illiterate, respectively. There was no difference in the occupational and educational status of the cases and controls. About 46% of the cases and 36.3% of the controls belonged to lower-middle socioeconomic status. The distribution of cases and controls according to the presence of risk factors is depicted in [Table 1]. The mean age at menarche in cases was 13.20 ± 1.33 years as compared to 14.58 ± 0.85 years in controls, and the difference was statistically significant. The cases had a higher age at marriage as compared to the controls; however, the difference was not statistically significant. Similarly, there was no difference in the mean age at first childbirth of cases and controls. The cases had statistically higher mean age at last childbirth (26.09 ± 5.32 years) as compared to the controls (25.05 ± 4.08 years). The mean duration of breastfeeding in cases and controls was 11.16 and 21.00 months, respectively (P < 0.001). The cases and controls were comparable with regard to the mean parity. However, the cases had a significantly higher number of abortions (61.3%) as compared to the controls (16.3%). Nearly 33.8% and 29.1% of the cases and controls, respectively, had post-menopausal status. There was a statistically significant difference in the mean age of menopause of cases and controls with cases attaining menopause at a late age (49.38 ± 5.21 years) as compared to the controls (47.89 ± 3.96 years). Nearly 1.9% of the cases were nulliparous. Similarly, 11.9% of the cases reported use of oral contraceptive pills as compared to 1.3% in controls (P < 0.001). 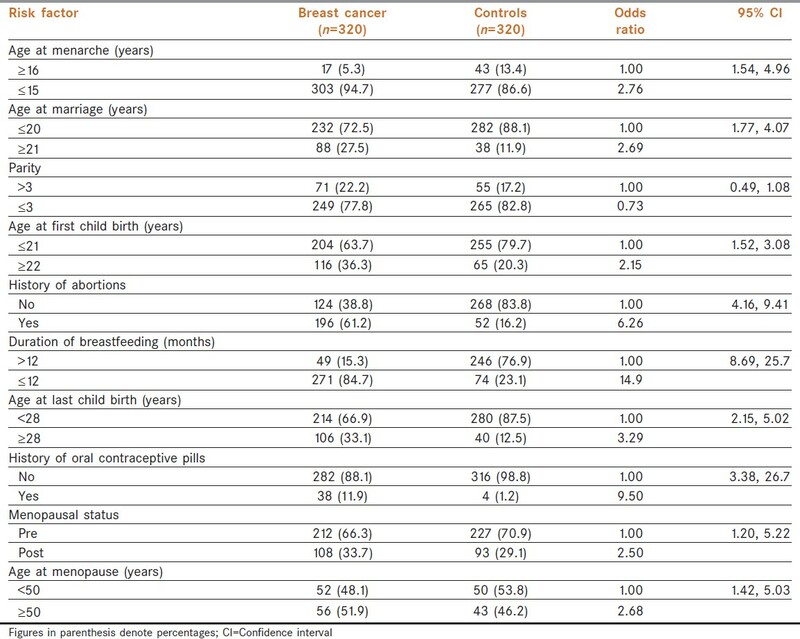 The unadjusted odds ratio for breast cancer according to the presence of risk factors is depicted in [Table 2]. It was found that the risk of breast cancer was 2.76 (95% confidence interval: 1.54, 4.96) times higher in those whose age of menarche was less than 16 years. Similarly, women who had an age of marriage more than 20 years had a 2.69 (95% confidence interval: 1.77, 4.07) times higher risk of breast cancer. No significant association was found between cases and controls with respect to parity. The age at first childbirth was also found to be associated with the risk of breast cancer with a twofold higher risk in women having their first child at more than 21 years of age. History of abortion was also found to be positively associated with the risk of breast cancer with 6.26 times higher risk in women having a history of abortion. The risk of breast cancer increased 14.9 (95% confidence interval: 8.69, 25.7) and 3.29 (95% confidence interval: 2.15, 5.02) times in women having mean duration of breastfeeding less than 13 months and age at last childbirth more than 27 years, respectively [Table 2]. It was found that the risk of breast cancer was 9.50 times higher in women having a history of consumption of oral contraceptive pills. Menopausal status was also found to be associated with the risk of breast cancer with post-menopausal women having a 2.50 (95% confidence interval: 1.20, 5.22) times higher risk. 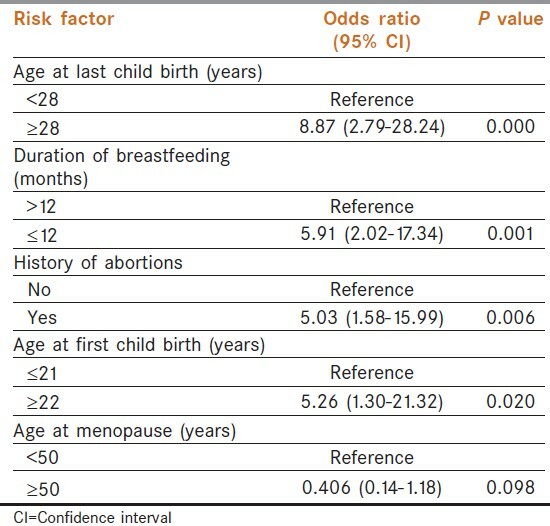 The risk also increased 2.68 times in women having a late age of menopause, more than 49 years [Table 2]. The family history of breast cancer was reported in 21.3% of the cases and none of the controls. All the covariates at Univariate analysis were included in the multivariate forward stepwise unconditional logistic regression analysis, taking inclusion and exclusion criteria of 0.05 and 0.21, respectively. 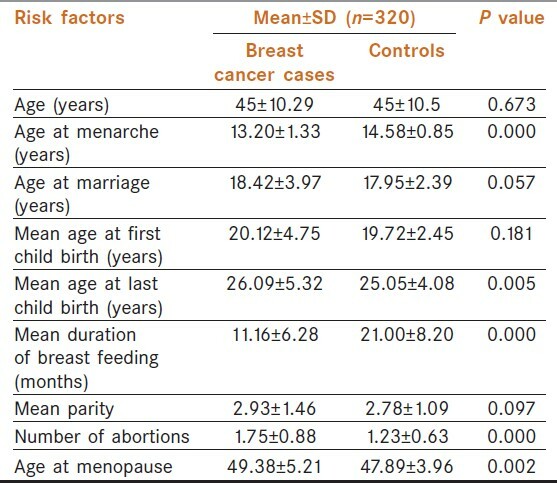 In the model ≥28 years of age at last childbirth, ≤12 months duration of breastfeeding, positive history of abortions, and ≥22 years of age at first childbirth were found to be positively related to the risk of breast cancer [Table 3]. One of the strongest predictors of a woman's risk of breast cancer is the presence of the carcinoma breast disease in her family. The family history of breast cancer was reported in 21.3% of the cases and none of the controls. There might be an underreporting of the family history of breast cancer by controls. However, it is difficult to distinguish between family aggregation and genetic predetermination. There are certain environmental and constitutional factors that may be more prevalent in certain families with no underlying genetic susceptibility. , The strong relation of family history is supported by other previous studies. ,,,,, The results of the present study revealed a possible association of reproductive factors with breast cancer in the Indian population. We are extremely grateful to Indian Council of Medical Research, New Delhi, for providing us the financial grant for conducting the study. 1. Henderson MM. Nutritional aspects of breast cancer. Cancer 1995;76:2053-8. 2. Schatzkin A, Jones DY, Hoover RN, Taylor PR, Brinton LA, Ziegler RG, et al. Alcohol consumption and breast cancer in the epidemiologic follow-up study of the first National Health and Nutrition Examination Survey. N Engl J Med 1987;316:1169-73. 3. Howe GR, Hirohata T, Hislop TG, Iscovich JM, Yuan JM, Katsouyanni K, et al. Dietary factors and risk of breast cancer: Combined analysis of 12 case-control studies. J Natl Cancer Inst 1990;82:561-9. 4. Gao YT, Shu XO, Dai Q, Potter JD, Brinton LA, Wen W, et al. Association of menstrual and reproductive factors with breast cancer risk: Results from the Shanghai Breast Cancer Study. Int J Cancer 2000;87:295-300. 5. Nandi S, Guzman RC, Yang J. Hormones and mammary carcinogenesis in mice, rats, and humans: A unifying hypothesis. Proc Natl Acad Sci U S A 1995;92:3650-7. 6. Michels KB. The contribution of the environment (especially diet) to breast cancer risk. Breast Cancer Res 2002;4:58-61. 7. Kelsey JL, Fischer DB, Holford TR, LiVoisi VA, Mostow ED, Goldenberg IS, et al. Exogenous estrogens and other factors in the epidemiology of breast cancer. J Natl Cancer Inst 1981;67:327-33. 8. Peeters PH, Verbeek AL, Krol A, Matthyssen MM, de Waard F. Age at menarche and breast cancer risk in nulliparous women. Breast Cancer Res Treat 1995;33:55-61. 9. Negri E, La Vecchia C, Bruzzi P, Dardanoni G, Decarli A, Palli D, et al. Risk factors for breast cancer: Pooled results from three Italian case-control studies. Am J Epidemiol 1988;128:1207-15. 10. MacMahon B, Trichopoulos D, Brown J, Andersen AP, Cole P, deWaard F, et al. Age at menarche, urine estrogens and breast cancer risk. Int J Cancer 1982;30:427-31. 11. Korenman SG. Oestrogen window hypothesis of the aetiology of breast cancer. Lancet 1980;1:700-1. 12. Wohlfahrt J, Melbye M. Age at any birth is associated with breast cancer risk. Epidemiology 2001;12:68-73. 13. Yu SZ, Lu RF, Xu DD, Howe GR. A case-control study of dietary and nondietary risk factors for breast cancer in Shanghai. Cancer Res 1990;50:5017-21. 14. Rao DN, Ganesh B, Desai PB. Role of reproductive factors in breast cancer in a low-risk area: A case-control study. Br J Cancer 1994;70:129-32. 15. MacMahon B, Cole P, Lin TM, Lowe CR, Mirra AP, Ravnihar B, et al. Age at first birth and breast cancer risk. Bull World Health Organ 1970;43:209-21. 16. Kelsey JL, Gammon MD, John EM. Reproductive factors and breast cancer. Epidemiol Rev 1993;15:36-47. 17. McTiernan A, Thomas DB. Evidence for a protective effect of lactation on risk of breast cancer in young women. Results from a case-control study. Am J Epidemiol 1986;124:353-8. 18. Tryggvadóttir L, Tulinius H, Eyfjord JE, Sigurvinsson T. Breastfeeding and reduced risk of breast cancer in an Icelandic cohort study. Am J Epidemiol 2001;154:37-42. 19. Chang-Claude J, Eby N, Kiechle M, Bastert G, Becher H. Breastfeeding and breast cancer risk by age 50 among women in Germany. Cancer Causes Control 2000;11:687-95. 20. Furberg H, Newman B, Moorman P, Millikan R. Lactation and breast cancer risk. Int J Epidemiol 1999;28:396-402. 21. Bernier MO, Plu-Bureau G, Bossard N, Ayzac L, Thalabard JC. Breastfeeding and risk of breast cancer: A metaanalysis of published studies. Hum Reprod Update 2000;6:374-86. 22. MacMahon B, Lin TM, Lowe CR, Mirra AP, Ravnihar B, Salber EJ, et al. Lactation and cancer of the breast. A summary of an international study. Bull World Health Organ 1970;42:185-94. 23. Henderson BE, Ross RK, Judd HL, Krailo MD, Pike MC. Do regular ovulatory cycles increase breast cancer risk? Cancer 1985;56:1206-8. 24. Petrakis NL, Wrensch MR, Ernster VL, Miike R, Murai J, Simberg N, et al. Influence of pregnancy and lactation on serum and breast fluid estrogen levels: Implications for breast cancer risk. Int J Cancer 1987;40:587-91. 25. Key TJ, Pike MC. The role of oestrogens and progestagens in the epidemiology and prevention of breast cancer. Eur J Cancer Clin Oncol 1988;24:29-43. 26. Murrell TG. Epidemiological and biochemical support for a theory on the cause and prevention of breast cancer. Med Hypotheses 1991;36:389-96. 27. Russo J, Russo IH. Toward a physiological approach to breast cancer prevention. Cancer Epidemiol Biomarkers Prev 1994;3:353-64. 28. Holmberg L, Ohlander EM, Byers T, Zack M, Wolk A, Bergström R, et al. Diet and breast cancer risk. Results from a population-based, case-control study in Sweden. Arch Intern Med 1994;154:1805-11. 29. Helmrich SP, Shapiro S, Rosenberg L, Kaufman DW, Slone D, Bain C, et al. Risk factors for breast cancer. Am J Epidemiol 1983;117:35-45. 30. Sweeney C, Blair CK, Anderson KE, Lazovich D, Folsom AR. Risk factors for breast cancer in elderly women. Am J Epidemiol 2004;160:868-75. 31. Gajalakshmi CK, Shanta V. Risk factors for female breast cancer. A hospital-based case-control study in Madras, India. Acta Oncol 1991;30:569-74. 32. Lipworth L, Katsouyanni K, Ekbom A, Michels KB, Trichopoulos D. Abortion and the risk of breast cancer: A case-control study in Greece. Int J Cancer 1995;61:181-4. 33. Erlandsson G, Montgomery SM, Cnattingius S, Ekbom A. Abortions and breast cancer: Record-based case-control study. Int J Cancer 2003;103:676-9. 34. Sanderson M, Shu XO, Jin F, Dai Q, Wen W, Hua Y, et al. Abortion history and breast cancer risk: Results from the Shanghai Breast Cancer Study. Int J Cancer 2001;92:899-905. 35. Lazovich D, Thompson JA, Mink PJ, Sellers TA, Anderson KE. Induced abortion and breast cancer risk. Epidemiology 2000;11:76-80. 36. Goldacre MJ, Kurina LM, Seagroatt V, Yeates D. Abortion and breast cancer: A case-control record linkage study. J Epidemiol Community Health 2001;55:336-7. 37. Marubini E, Decarli A, Costa A, Mazzoleni C, Andreoli C, Barbieri A, et al. The relationship of dietary intake and serum levels of retinol and beta-carotene with breast cancer. Results of a case-control study. Cancer 1988;61:173-80. 38. Toniolo PG, Levitz M, Zeleniuch-Jacquotte A, Banerjee S, Koenig KL, Shore RE, et al. A prospective study of endogenous estrogens and breast cancer in postmenopausal women. J Natl Cancer Inst 1995;87:190-7. 39. Collaborative Group on Hormonal Factors in Breast Cancer. Breast cancer and hormonal contraceptives: Collaborative reanalysis of individual data on 53,297 women with breast cancer and 100,239 women without breast cancer from 54 epidemiological studies. Lancet 1996;347:1713-27. 40. van Hoften C, Burger H, Peeters PH, Grobbee DE, Van Noord PA, Leufkens HG. Long-term oral contraceptive use increases breast cancer risk in women over 55 years of age: The DOM cohort. Int J Cancer 2000;87:591-4. 41. Hirose K, Tajima K, Hamajima N, Takezaki T, Inoue M, Kuroishi T, et al. Association of family history and other risk factors with breast cancer risk among Japanese premenopausal and postmenopausal women. Cancer Causes Control 2001;12:349-58. 42. Anderson DE. Breast cancer in families. Cancer 1977;40:1855-60. 43. Bain C, Speizer FE, Rosner B, Belanger C, Hennekens CH. Family history of breast cancer as a risk indicator for the disease. Am J Epidemiol 1980;111:301-8. 44. Lê MG, Hill C, Kramar A, Flamanti R. Alcoholic beverage consumption and breast cancer in a French case-control study. Am J Epidemiol 1984;120:350-7. 45. Jones DY, Schatzkin A, Green SB, Block G, Brinton LA, Ziegler RG, et al. Dietary fat and breast cancer in the National Health and Nutrition Examination Survey I Epidemiologic Follow-up Study. J Natl Cancer Inst 1987;79:465-71. 46. Graham S, Hellmann R, Marshall J, Freudenheim J, Vena J, Swanson M, et al. Nutritional epidemiology of postmenopausal breast cancer in western New York. Am J Epidemiol 1991;134:552-66. 47. Daling JR, Malone KE, Voigt LF, White E, Weiss NS. Risk of breast cancer among young women: Relationship to induced abortion. J Natl Cancer Inst 1994;86:1584-92. 48. Männistö S, Pietinen P, Pyy M, Palmgren J, Eskelinen M, Uusitupa M. Body-size indicators and risk of breast cancer according to menopause and estrogen-receptor status. Int J Cancer 1996;68:8-13.